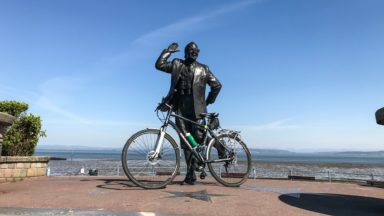 A guidebook to the Lancashire Cycleway, a figure-of-eight shaped route that visits Morecambe Bay, the Bowland Fells and the West Pennine Moors. The two distinct loops are around 130 miles (225km) each and meet at Whalley in the Ribble Valley. 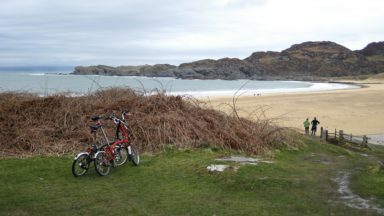 Also includes 17 day rides of 13¾ to 46 miles (22 to 74km). Year-round possibilities, although poor weather in winter is to be avoided. Whalley, Clitheroe, Burnley, Wigan, Preston, Lancaster, Blackpool, Lytham St Anne's and Kendal are all within easy reach or on the route. Easy through to fairly challenging. All within the range of a moderately fit cyclist. Access by rail at numerous points means that less experienced cyclists can do it in shorter sections. Crossing the Forest of Bowland, exploring the villages of western Lancashire. 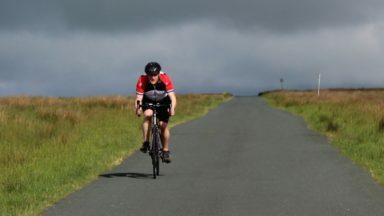 Comprising two distinct loops that intersect at Whalley in the Ribble Valley, the 425km (265 mile) Lancashire Cycleway showcases the idyllic scenery of England's historic Red Rose County. The Northern Loop contrasts the quiet lanes and peaceful countryside of northwestern Lancashire with the thrill of the open moors of the Forest of Bowland AONB; the Southern weaves its way between the villages and towns in the south of the county, an area rich in social history. Easily accessible from the region's rail network, the route – which is all on-road – can be cycled either as a tour or a series of day rides. This guidebook presents the Lancashire Cycleway in 11 stages of 26.6-49.7km (16.5-30.9 miles), plus two short connections to link the loops to the major regional stations at Lancaster and Wigan, as well as 17 varied day rides for those wishing to explore the county further. Detailed route description and 1:100,000 mapping is presented alongside a wealth of information on local points of interest and facilities, and the magnificent colour photography offers a small taste of what the routes have to offer. 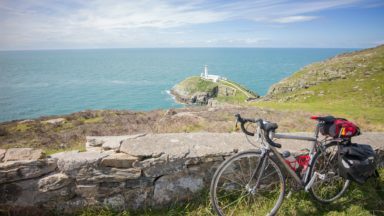 The guide also includes useful advice for those new to cycling or cycle touring. 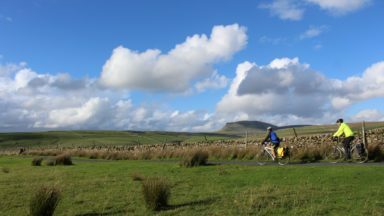 Lancashire is a great place to cycle, and cycling is a great way to see Lancashire. One of its delights is its sheer variety. 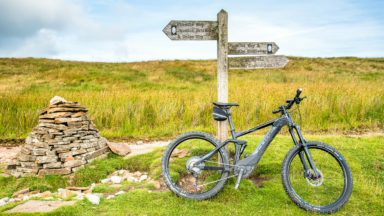 There's easy riding on the flat expanses of the west of the county and the gentle undulations of Arnside and Silverdale or the Ribble Valley. More stirring challenges are found in West Pennine Moors and the epic crossing of the Bowland Fells. But even on the wildest stretches, you're never too far from a welcoming pub and somewhere to sleep. "domiciled in garstang, a few miles north of preston, jon sparks resides pretty much in the centre of his world, ideally situated to be better acquainted with the surrounding roadways than the majority of his readers. which, to place not too fine a point upon it, is precisely the sort of fellow i'd want to be guiding me around the lancashire countryside north west of manchester. all [routes] are extremely well illustrated with both photographs and clearly defined maps, while sparks' narrative takes the prospective rider from start to finish via every turn in the route. 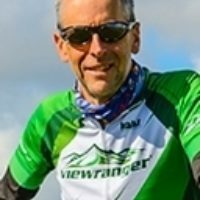 those northern and southern loops, while suitable for one-day rides by the intrepid cyclist aboard an appropriately speedy machine, are further split into smaller rides that might also occupy a more leisurely approach, festooned with a modest quantity of coffee and cake. each to their own; it's very much to the author's credit that his organisation of the book's contents allows for a very wide interpretation of what constitutes energetic and exploratory cycling. if you plan on holidaying in the lancashire area for a day or considerably longer, it ill-behoves you to leave home without a copy of this book either in a jersey pocket or ensconced within a bar bag." The guide makes imaginative use of the rail network. Admirable form a green perspective, this strategy allows a wider variety of day routes to be offered, as well as escapes options. It would be entirely possible to use bike and train to complete most of the routes described. Overall, this guide can be recommended to get you away from the beaten track and to take you through some well-known beauty spots, as well. I have enjoyed reading it and will now tuck it into my jersey pocket and head for Wigan!